Heat oven to 350°F. (325°F for dark or nonstick pan). Grease bottom of 9-inch square pan with shortening or cooking spray. Make and bake brownies as directed on box for cakelike brownies. Cool completely on cooling rack, about 1 1/2 hours. In medium bowl, stir together frosting, marshmallow crème, mint extract and food color until well blended. Spread over cooled brownies. Sprinkle with cookies; press in slightly. Cut into 4 rows by 4 rows. 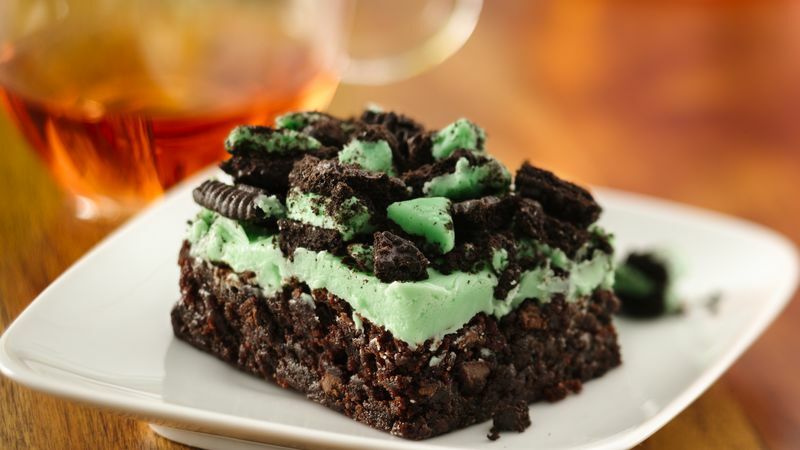 Instead of chocolate mint cookies, top with chopped thin rectangular crème de menthe chocolate candies. For easier cutting, refrigerate frosted bars 30 minutes, then cut into bars.